This is a petition for review under Rule 45 of the Rules of Court, which seeks the reversal of the Decision and Resolutionof the Court of Appeals. The case originated from a complaint for specific performance with damages filed by Spouses Gavino and Carmelita (respondents) against Esperanza and her son, JJazer. The respondents alleged that sometime in May 1986, Esperanza and her husband, Jose, acquired from one Roberto the rights over a parcel of land under the name of the Government Service Insurance System (GSIS). Their transaction was covered by a Deed of Assignment and Transfer of Rights with Assumption of Obligations. Esperanza and Jose were to assume the payment of the applicable monthly amortizations for the subject land to the GSIS. Several amortizations remained unpaid by Esperanza and Jose, resulting in an impending cancellation in 2005 of GSIS’ conditional sale of the subject property to Roberto. The respondents alleged that Esperanza and Jazer undertook to execute a Deed of Absolute Sale in favor of the respondents once the title over the subject property was transferred to their names, subject to the condition that they would be given the first option to buy it back within three years by reimbursing the expenses incurred by the respondents on the property. The respondents demanded from Esperanza and Jazer the fulfillment of their commitment to transfer the subject property to the respondents’ names through the execution of a deed of sale. When Esperanza and Jazer failed to comply despite efforts for an amicable settlement, the respondents filed with the Regional Trial Court (RTC) of Biñan, Laguna the subject complaint for specific performance with damages. Esperanza and Jazer disputed these claims. They argued that there was neither a written or verbal agreement for the transfer of the disputed property to the respondents’ names, nor a promise for the repayment of the amounts that were paid by the respondents. Esperanza believed that Gavino paid her outstanding balance with the GSIS out of sheer generosity and pity upon her. The RTC of Biñan, Laguna rendered judgment in favor of the respondents. Feeling aggrieved, Esperanza and Jazer appealed to the CA. The CA affirmed the rulings of the RTC. Is the money paid by the respondents a donation? The petition is bereft of merit. Art. 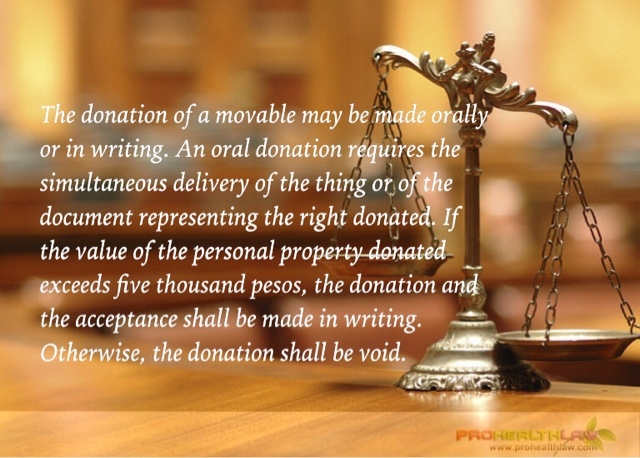 748 of the civil code provides that the donation of a movable may be made orally or in writing. An oral donation requires the simultaneous delivery of the thing or of the document representing the right donated. If the value of the personal property donated exceeds five thousand pesos, the donation and the acceptance shall be made in writing. Otherwise, the donation shall be void. As the Court ruled in Moreño-Lentfer v. Wolff (484 Phil. 552, 2004 ), a donation must comply with the mandatory formal requirements set forth by law for its validity. When the subject of donation is purchase money, Article 748 of the NCC is applicable. Accordingly, the donation of money as well as its acceptance should be in writing. Otherwise, the donation is invalid for non-compliance with the formal requisites prescribed by law. While Esperanza claims that her brother’s generosity was the consideration for the respondents’ payment of her obligations, this was not sufficiently established, that even the respondents vehemently denied the allegation. In order to sufficiently substantiate her claim that the money paid by the respondents was actually a donation, Esperanza should have also submitted in court a copy of their written contract evincing such agreement. Therefore, the money paid by the repondent is not a donation. ESPERANZA C. CARINAN, Petitioner, vs. SPOUSES GAVINO CUETO and CARMELITA CUETO, Respondents.